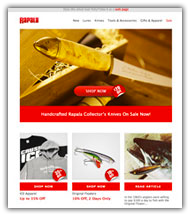 How to use the Rapala® Deluxe Cordless Fillet Knife Set PGEFR. Always disconnect battery pack before inserting blades and when not in use. Insert blades into keyhole slot until they click into place. Connect battery pack to motor housing by pressing down thumb tab and sliding into place. To engage motor: pull safety switch down then press trigger in to activate. Always disconnect battery pack before removing blades and when not in use. Press down on release button and grasp safety grips. Now, slip blades forward, away from motor housing. First, plug AC cord into battery base. Now plug in to wall outlet. Press battery down firmly into base. Charge will automatically start charging (solid red light). 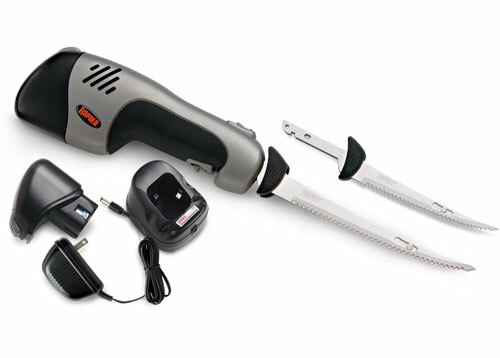 This is a fast “top-off” charge of the battery, just enough to finish filleting. Unit will automatically shut off when the battery is fully charged and ready to use (solid green light).